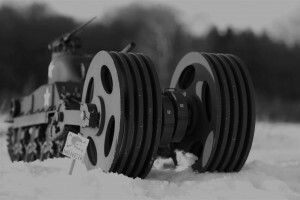 Images show prototype mounted on DT-02 chassis. that attracted many to the exciting world of R/C. 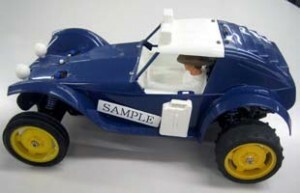 Now, Tamiya is proud to re-release the Holiday Buggy to celebrate its 30th year anniversary. and relive the fun and easy-going driving performance of this machine. 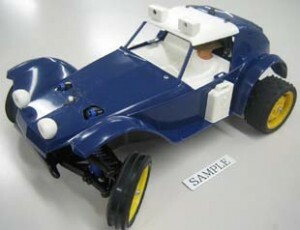 -This is a 1/10 R/C assembly kit of the special edition Holiday Buggy. -This item meets ROHS regulations. -Features the same ribbed front and spike rear tires as the original. -Newly designed full-body sticker sheet included. -Blue colored durable polyethylene (PE) body included. -Comes mounted on the excellent handling 2WD DT-02 chassis. This entry was posted in Future Releases on June 19, 2010 by admin. This entry was posted in Media on June 18, 2010 by admin. 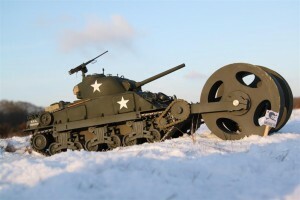 “After I built my first tank (a Tamiya Panther G), I wanted to make a conversion of the Sherman tank. In a book I found some pictures of this strange looking mine clearing tank. 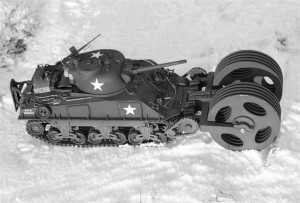 In May 1944 two prototypes of the Sherman with T1E3 mine-exploders were sent to Britain. They were demonstrated to US and British officers. These tanks were nicknamed “Aunt Jimima” after a popular pan cake mixes logo, because somebody thought the big exploder wheels resembled gigantic pancakes. The Whiting Corporation built at least75 T1E3s between March and December 1944 (some reports say 200 were built). At least 27 of them saw action with the US first army in France, Belgium, Germany and with the 7th (?) army in Italy. 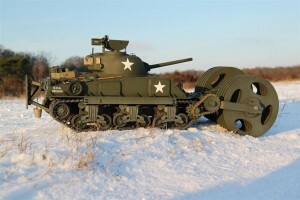 The T1E3 wasn’t very practical, it took the space of 2 or 3 football fields to make an U-turn and with it’s 54 tons it often got stuck in the mud so a pusher-plate (or bumper) was attached to the rear of the tank to permit another tank to get behind the mine-exploder tank and give it a push. This entry was posted in Customized Builds on June 7, 2010 by admin.